PARADISE FOUND AT PRINCESA, STAY AT UNIT A 102, THE BEST VACATION EVER! The Princesa Resort was designed to enhance the views of the Sea of Cortez. There is a Volleyball court in the center of the resort where you can play under the beautiful sun. Though exclusive, this gorgeous condominium complex is only minutes away from the center of Rocky Point. You can explore town for restaurants and super stores, or enjoy the excellent options for you on site, that will save you time. Colin's Restaurant is family oriented. Its menu has everything from sea food to pancakes, and is an excellent place to go to watch sports and have drinks. There is also a convenience Store where you can buy just about anything from goggles for the pool to wine for dinner. This is a beautiful ground floor unit which is located on the front of the beach, only a few steps from the pool. You can stay in the unit and keep an eye out for the kids. This units location allows you to sit back, relax, and enjoy the amazing views of the Old Port and outstanding sun rises. It has been beautifully furnished. The master bedroom has a spacious king size bed, the guest bedroom has two full size ones. In the living room you will find a sofa sleeper in case you bring 2 extra people. The sleeping arrangements give you privacy for you and your family. The unit layout was carefully designed to enhance the space, and comfortably accommodate up to 6 people. 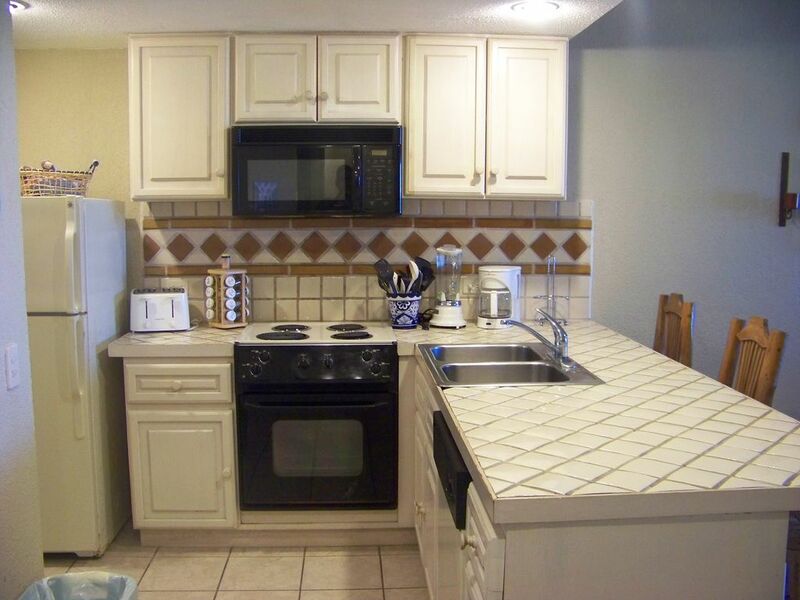 The fully equipped kitchen has all of the cookware you will need to prepare meals in the unit in case you prefer to stay at the resort. The laundry room has a full size washer and dryer that you can use while you enjoy the pool, rather than losing precious worrying about where to go to get your laundry done. This condominium gives you a sense of being at home, rather than being at a rental property. While kids are watching TV or their favorite DVD, you may sit in the patio and read a book. The most beautiful views can be found here. This unit will get you closer to paradise, right in front of the pool and a few steps from the beach. What are you waiting for? You could be getting your toes in the sand and a nice tan right now! Reserve today.